Enter an underground world of mesmerizing rock formations and rare animals at this UNESCO world heritage site. Wait for your eyes to adjust to the dimmed lighting of the cave and let the spectacular arena of the Manjanggul Cave appear around you. The first thing you will notice is the cathedral-like size of the tunnel. Look closer at the walls and you start to see nature’s artistry at work. Formations of stalactites, stalagmites and a seven-meter high lava column make for a breathtaking sight. The Manjanggul Cave is a lava tunnel that formed somewhere between 200,000 to 300,000 years ago when molten rock burst free from the earth. While many lava tunnels are barely big enough to enter, the Manjanggul is one of the largest in the world. It reaches heights of 98 feet (30 meters) in places, and spans 75 feet (23 meters) at its widest point. While your visit will only take you just over half a mile (one kilometer) into the cave, the entire network of tunnels runs for over eight miles (13 kilometers). Climb down the steep wooden staircase into the mouth of the cave. A well-lit walkway will guide you from here. You may want to take a torch, as the light can be dim in places. Most of the interesting rock formations are lit up in a range of colors that add to the cave’s eerie atmosphere. Don’t miss the Turtle Rock, shaped like a turtle and resembling Jeju Island. The path will take you past a wing shaped wall, before bringing you to the most spectacular rock formation of them all – a giant lava column. At 24 feet (7.6 meters) tall, it’s the largest known lava column in the world. Keep your eyes peeled for the largest bat colony on Jeju Island that dwells in the cave’s catacombs. There are over 30,000 bats in the cave. Other creatures reside here too, with the Jeju cave spider one of the most notable. You’ll want to bring a jacket as temperatures in the cave can be chilly, and water drips from the ceiling aren’t uncommon. The walk takes approximately 45 minutes to complete. Manjanggul Cave is located about 18 miles (30 kilometers) east of Jeju City. A bus ride takes about 30 minutes. It is open daily, with slightly shorter hours in the winter. There is a charge for entry. 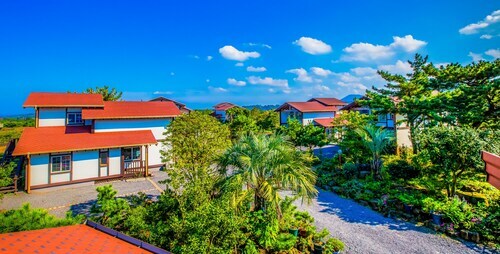 You ought to think about buying a 2-Day Jeju Island Tour to Folk Village, Cave & Sunrise Peak or a Private Full-Day Tour of Jeju Island Sights & Food while you're visiting. These experiences are a few of the best. Check out our Jeju things to do page to find even more activities while you're here. 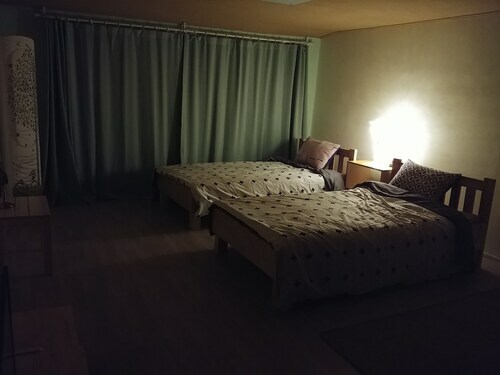 Located in Gujwa, this pension is 3.1 mi (5 km) from Woljeong Beach and 13.2 mi (21.3 km) from Seongsan Ilchulbong. 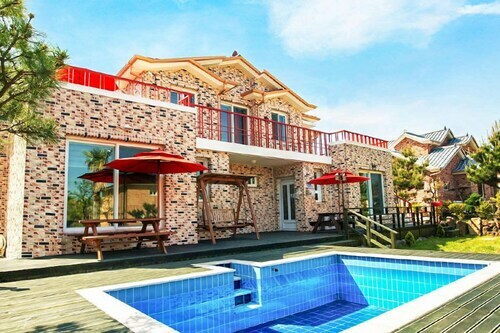 Located in Gujwa, this pension is 4 mi (6.4 km) from Woljeong Beach and 14 mi (22.6 km) from Seongsan Ilchulbong. Located in Gujwa, this pension is 3.9 mi (6.3 km) from Woljeong Beach. 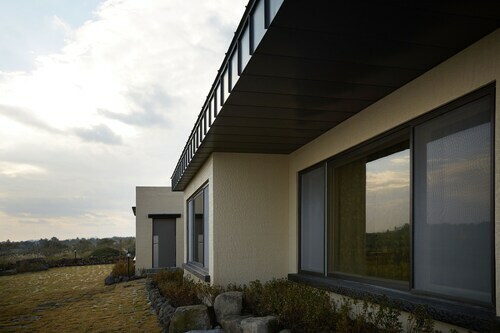 Located in Gujwa, this pension is 4.2 mi (6.7 km) from Woljeong Beach and 15.2 mi (24.4 km) from Seongsan Ilchulbong. 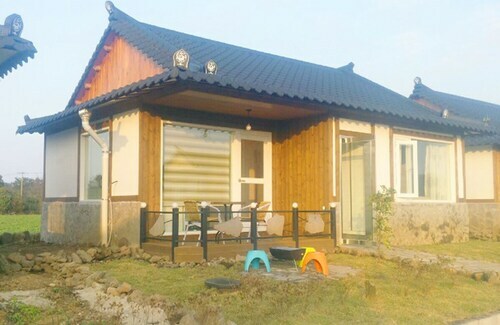 Nestled on the beach, this Gujwa pension is 2 mi (3.3 km) from Woljeong Beach and 12.2 mi (19.6 km) from Seongsan Ilchulbong. Located in Gujwa, this hotel is 3.5 mi (5.6 km) from Woljeong Beach. 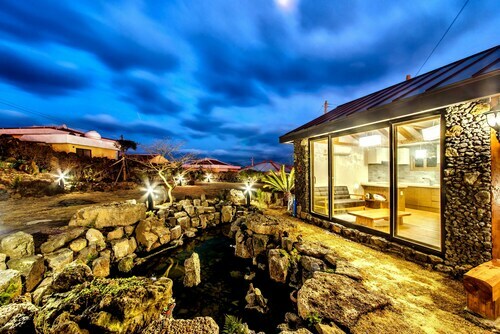 Located in Gujwa, this guesthouse is 4.9 mi (8 km) from Woljeong Beach. Located in Gujwa, this villa is 0.2 mi (0.4 km) from Woljeong Beach.